Am I being stupid ? I would like to loop samples to the beat with loop markers while playing notes. Is this possible because I can’t find it anywhere? I thought I knew what you were asking but now I'm not sure. Do you mean setting sustain loop points in the sampler or do you mean setting a song loop marker while you're preforming in either the Obsidian synth or Slate drum sampler? Or maybe you’re asking how to have a sample repeat, synchronized to the beat, as long as a key or pad is held down? I want to set a sustain loop in real time so as to get the, lead up to the sustain loop and the sustain loop in time with the beat, like in a standard sampler. From what I can See the loop I got can only be done offline? @TwistedGenetics I may be misunderstanding too, but there’s always the old school way to use sample loops in Slate (like you would on a hardware sampler). Set the Amp Decay to max, put it in a Group with max polyphony of 1. Then set a loop on the main sequencer as many bars long as the sample, put a sequence with one note of that pad on the first step (doesn’t need to be long, because of the Decay). Press play and tap out the tempo. Use the fine adjust to dial it in so it loops correctly. Alternatively, you could transpose the pad until it matches the tempo. Of course, if this is not what you're talking about then I clearly misunderstood your question. Hope this is helpful though. So in BM3, ableton, and my emu sampler I can set loops in real time. I can put my finger on the keys (while beat is playing) and also move the loop points until I have a section that I like, that loops in time with the beat. Ok, I get what you mean. It doesn’t work that way, but you can use the sequencer a bit like that, by putting the loop into a choke group, putting one note at the beginning of the bar and moving a second note around. You get different loop effects, which you can then duplicate. It’s not the same and I would love if the sampler would sync playback with the timeline, that would help some. 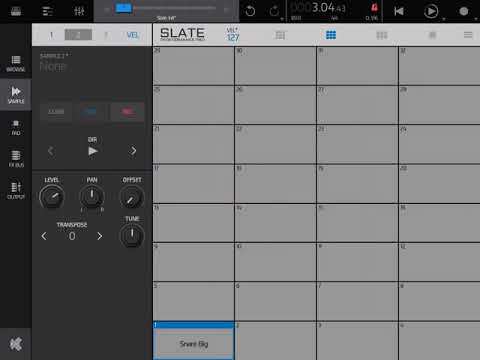 You can also create loops in the sampler with snap to grid on, which means they will be the perfect length and in time. Edit: ah, I see dendy already explained this. Of course it would be great, if after time, NS2 gets all those things, that were already in the original nanostudio. Dropping features is always unexpected by Oldtimers (which I am not). In Obsidian, you can map macros (or XY pad) to Sample start, Loop start and Loop length. It's not visual but fiddling with those three controls will essentially do the same thing as the video. Instead of an explicit Loop End (I assume that's what LE means), you set the loop start and then Loop Length. I guess they both have their benefits but a benefit of setting Loop Length instead of a fixed End position is once you have a length you want, it's easy to mess with the start and keep the loop in time. If I recall correctly you'll want to set the Loop Length macro to -100. Also, these can be automated and all NS automation conforms to MIDI CC standards. That means the 'resolution' of these macros is fixed to 128 steps. Meaning it'll work best with shorter samples. These kind of behaviours make things much more fluid/intuitive.